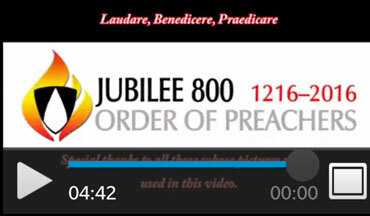 The Order of Preachers or Dominican Order spread throughout Europe rapidly. The first Irish foundation was in Dublin within eight years, in 1224. The community was composed of English–born Dominicans. 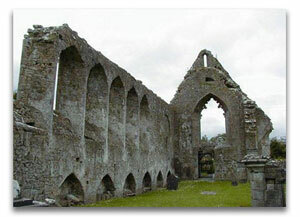 Other houses followed quickly with Anglo–Irish and then Irish–born friars. The two houses nearest to Clonakilty, where there was no house, were Cork (founded 1229) and Tralee (1243). By 1400 A.D. there were at least twenty–four houses. The tension between the Anglo–Irish and Irish continued until 1536 when the Irish Province was established. In that year the Irish Reformation Parliament established Henry VIII as King of Ireland, dissolving the monasteries at the same time. This could be accomplished only in the Pale. However, gradually all the houses were suppressed and the friars were scattered and persecuted. Most of them lived with the laity. Many had to flee to Europe where they established houses in Lisbon, where Irish Dominicans still live and work, Salamanca and Louvain, both now closed, and San Sisto and San Clemente, Rome, the latter still occupied by Irish friars. Back in Ireland preaching the Rosary was their greatest apostolate as they could not celebrate Mass openly in Ireland. Altogether there were ninety–eight Irish Dominican martyrs, not all of whom had their causes presented in the official list. These included one bishop, eighty–five priests, three lay women belonging to the Thi9rd Order and one lay man. As the persecution eased the Dominican restoration grew. By 1627 twelve houses with one hundred friars re–opened. Novices were sent to Europe and there were fifty of these and many friars. Under Cromwell the persecution was continued with many martyrs and loss of Church buildings and residences. Two of those beatified as Irish Martyrs came from this period. They were Bishop Terence Albert O’Brien and fr. Peter Higgins. In the 18th century, at first under Queen Anne, and then continuing until the end of the century, the English continued legislation against the Catholic faith and those who upheld it but at a lower level there was much peace. When the Dominican Priory in Galway was searched and nothing found, there was an entry in the account books which read: “For claret to treat the Sheriffs in their search on 11th. 2s. 2d.” As a result of this change of attitude the Irish Dominican priests in Europe began to return to Ireland. The revival commenced in the early 19th century with a significant gain by mid–century. Houses, particularly the Tallaght Priory in 1856, and many others were founded or resurrected. Tallaght became the House of Studies and novices and students no longer went to Europe but completed their priesthood preparations there. One of the great innovations was parish retreats and missions and this occupied the friars greatly. In the twentieth century the great development was on the missionary outreach that had commenced the previous century. Foundations were made in Australia and Trinidad & Tobago. In 1950 Australia became a province on its own. About that time there were sixty–five Irish Dominicans working in Trinidad & Tobago. In that same century a mission was opened in India and it also became an independent province in a short time. At this present time the most significant characteristic of the twenty–first century is the decline in numbers. At one stage there were six hundred members in the Irish Province. By 1950 that figure was a little over four hundred. Now there are just fewer than one hundred and forty, the majority of whom are over sixty years of age. Nevertheless, the apostolates and ministries are continuing. Vocations are the great need and that is something which is left in the hands of God with cooperation from the brethren. Everything written to this point refers to the Dominican friars or men. But there is a grand history of women Dominicans also. Before he founded the Order of Preaches, St. Dominic founded a house for nuns who were converts from heresy and needed a place to protect them. Before he died he had founded eight monasteries for women, not all of which were for former heretics. Dominicans refer to three Orders of Dominicans. The first Order is that of the men, the friars. The Second refers to the enclosed contemplative nuns who life is devoted to prayer and contemplation with little public activity in an organised way. The third has two aspects. The community nuns who teach or do some external organised apostolates and the other aspect is that of the laity. The Second Order: The first foundation of Irish Dominican Nuns was in Lisbon in 1639. The nuns continue there until the present though some years ago, due to lack of Irish vocations, they joined the Dominican Sisters whose mother–house is in Cabra, Dublin. The first house for Irish Dominican women in Ireland was in Galway in 1644. In 1651 the nuns were banished and fled to Spain where they joined various convents. Only two, aged seventy–five years, were alive to return to Galway in 1686. In twelve years they received fourteen young women into the Order. They are still in Galway but now belong to the Cabra Congregation. The Cabra foundation had been made by the Galway nuns. A most important foundation by the Galway nuns was in Drogheda in 1722 when a monastery was established there and is still most active. It is the only completely enclosed contemplative Dominican convent in Ireland. The Third Order: The Cabra foundation belongs to the Third Order of Dominicans. They have a mission in Brazil, Louisiana, USA, Argentina and South Africa. In Ireland they have twenty–four houses or convents. Their main ministry has been teaching. As well as the Sisters who live in community, the Third Order includes women and men who live at home but follow the special Dominican Rule, in existence since 1285, updated of course since then. They live their lay state as married or single but are guided by the rule. They meet regularly in meetings that are called ‘chapters’. There are almost thirty of these throughout Ireland.